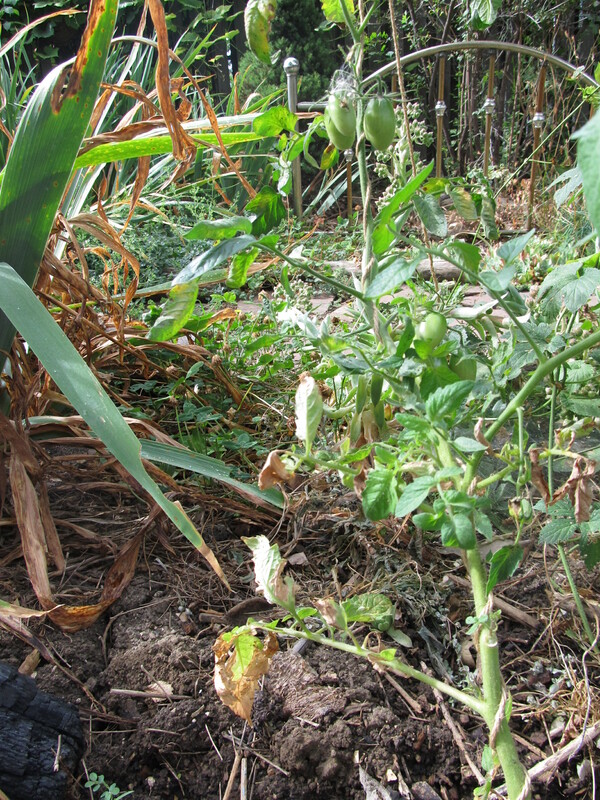 Tomato A, with rich chunky, water retaining compost. I had a paradigm shift this spring. I love that. I have always read that tomatoes are heavy feeders, that they need rich soil, so I have planned my rotations to give that to them. I hopscotch my compost bin around the garden, trying to balance out the need for soil improvement with the pain in the neck factor of walking all the way to the back corner of the yard when I need to dump avocado peels. I read in The Tao of Gardening, by Carol Deppe that tomatoes will produce fruit earlier when they are grown in poor soil. So, they would be heavy feeders if they were allowed to be, but it makes them slow and lazy. I decided to test it. 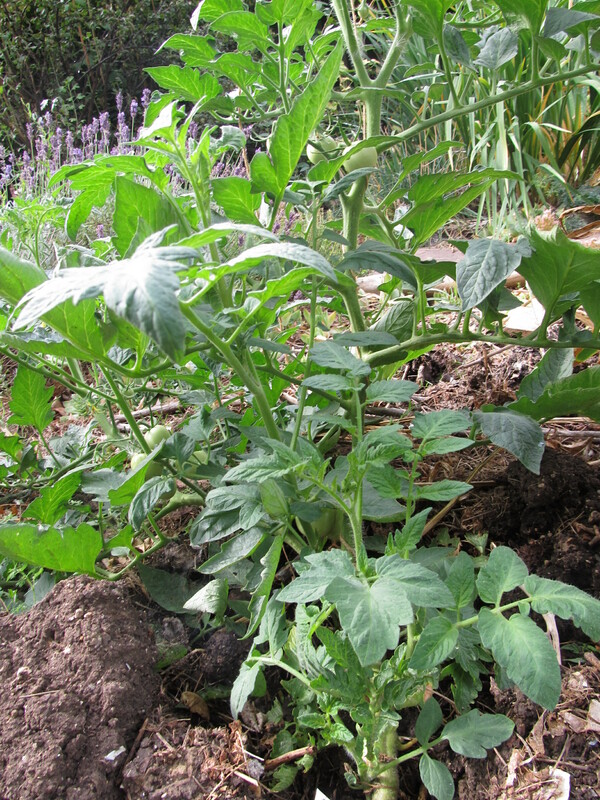 I had the lovely, chunky nutrient rich black soil, with some still identifiable avocado peels (those things take forever to break down) where I had intended to place the tomatoes in the first place, and a few feet away, some clayey, brown soil. It wasn’t terrible, It has had compost added to it in the last few years, but it wasn’t the rich soil I usually reserve for the tomatoes. They both get about the same amount of sun, and while they are different varieties (Fourth of July and Juliet) they both have about the same number of days to maturity and I have given them the same amount of water. Tomato B, no soil enrichment. In my day job, I have had a paradigm shift as well- I have always taught English, and beyond that, I have always been an English teacher, with that mindset. This past year, I have been working with students who are learning English in their math and science classes. It’s been weird. Good, but weird. I had to think in a way that I’m not used to. Staving off dementia one hypothesis at a time. So the hypothesis in this tomato experiment was that the tomato plant with lush soil would produce a lot of leaves, but would fruit later, and the plant in poor soil would make fewer leaves, but would fruit earlier. Well, on August 4, I don’t have ripe fruit from either of them. The one in poor soil has slightly pinker fruit, but not by much. There are many more tomatoes on the plant in richer soil, so i would prefer to balance out quantity over earliness. Another detail, which I wasn’t hypothesizing about, is that the one with rich soil is much more drought tolerant. When we left town, temperatures got over 100 degrees F. When we got back, the plant in good soil was still lush and green, and the one in poor soil was slightly withered. I think it hasn’t completely recovered from that drought stress, where the other plant had enough moisture reserve in the soil that it did fine.As you grow, remember that it isn’t just about the fruits and vegetables, you can experiment and learn and improve. Science- you can grow that.